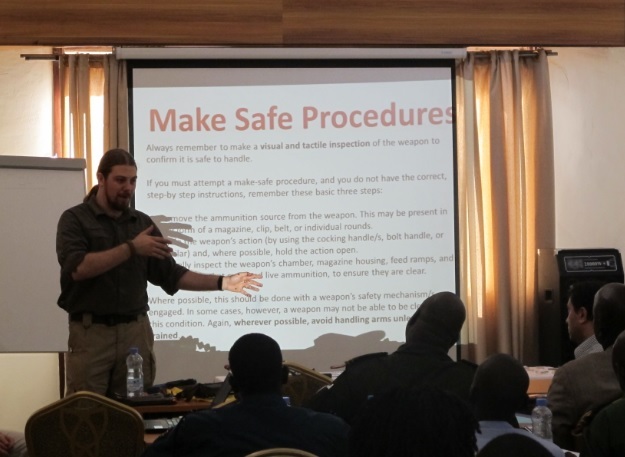 Delivering training to law enforcement and military in South Sudan (2013). N.R. Jenzen-Jones is a military arms & munitions specialist and security analyst focusing on current and recent conflicts. He consults on an independent basis, offering technical expertise and analysis to a range of government and non-government entities. He has written extensively on a range of small arms and small arms ammunition issues, as well as providing technical analyses of incendiary weapons, cluster munitions, and arms proliferation. Other research fields include counter-piracy, counter-narcotics, and exploitation of technical intelligence. He is a certified armourer and ammunition collector. He is a co-editor and a frequent contributor to Security Scholar. You can follow Nic on Twitter here. You can view Nic’s LinkedIn profile here. You can email Nic here. I have written a handful of beer reviews here.